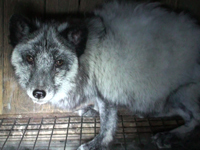 Over two years, from 2014 to 2016, ADI recorded operations at a fur farm in Poland, documenting the life experiences of foxes farmed for their fur. The animals live in cramped, barren wire mesh cages with no space to run or explore and nothing to occupy the interest of these intelligent, inquisitive and highly active animals. 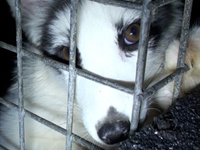 Some of the cages were similar to the size of a travel crate that one might use to temporarily transport a dog. However, these foxes remain in the cages for the whole of their short lives. Due to the extreme confinement, living inside an exposed wire mesh box, the animals suffer both psychological and physical damage. Water is provided in a tin can attached to the side of the cages and food is dumped on a tray attached to the outside of the cage for foxes to eat through the mesh. The cages are raised off the ground to allow the animals’ faeces and urine to fall beneath, left to just pile up. Contrast these stark conditions to their diverse natural environment and diet. Naturally shy and secretive animals, foxes have large territories and live in dens below ground in open country. They eat a wide range of foods including small mammals, fish, birds’ eggs, insects, grass, berries and other fruits. Foxes come from the same family as domestic dogs and behave in similar ways; Borys, Eryk and Aleska are intelligent, emotional and affectionate. 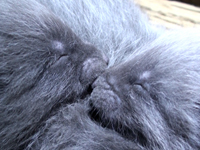 Born in a nesting box attached to their bare wire cage, their cage, their mother nursed and cared for them during their first weeks of life before she was removed, leaving the siblings to fend for themselves. The trio remained in the cage as they grew, their fur changing to white over the summer, in readiness for the winter. In the wild, Arctic foxes like Borys, Eryk and Aleska are nomadic, travelling many miles each day over the ice , their fur protecting them from the cold. Instead of a lifetime of experiences, at less than 7 months of age Boris and then Eryk were removed from their cage by the farmer and killed. As he approached the cage the family became agitated, having seen others killed; they retreated to the far end of the cage, but there was nowhere to hide. Held by their tails, upside down, the young foxes struggled as they were hung up by a back leg and electrocuted. Their frightened sister Aleska could only watch on, as her terrified brothers were killed in front of her. Left alone in the cage, she would be used to produce next year’s babies for the trade. We followed the life of another fox, she was distinctive, with white fur and dark patches around her eyes and lived as a young cub with her siblings, but was then separated from her family. This young female was isolated from other foxes in a series of different cages, some less than a square metre. For an animal needing a large, rich and challenging wild territory, such excessive confinement is torture. At one year old she gave birth to two cubs, from whom she was later separated, a mesh partition dividing the cage. An escaped fox wandered around the farm; two men were seen chasing the fox, each holding a short plank of wood like a club, with another man carrying a net. The fleeing animal’s deformed feet, the result of living on wire mesh, can clearly be seen. The cages in which the animals are forced to live are unstable, bending under the weight of their inhabitants of the foxes’ feet protruding through the gaps in the mesh. Young foxes attempt to engage in play, but their behaviour is restricted by the confines of the cage. ADI’s previous investigations have uncovered similar conditions, with incidents of deficits in animal care including untreated infection or disease in animals’ eyes, noses and ears, open wounds, loss of tails, malformed limbs and dilapidated cages. Footage clearly showed animals suffering terribly as a result of the environment in a number of fur farms. safety of their family group . Foxes are affectionate, social animals who communicate in complex ways including vocalisations like barks, whines, howls and yelps, as well as scent marking. Naturally inquisitive, young foxes love to play and investigate their natural surroundings. These behaviours are denied the animals on fur farms, the constant deprivation having a devastating impact on their psychological and physical health, resulting in a lifetime of chronic suffering.